How do you make an anti-super-hero movie about a Marvel comics character (Venom) who is closely entwined with one of the most famous Marvel super heroes without actually mentioning that super hero? It’s something that director Ruben Fleischer just about managed to pull off with a little plot rewriting and backstory editing because, for now, Sony isn’t allowing this ultra violent Marvel character anywhere near family friendly Spider-Man. In fact, Venom thematically resembles Sam Raimi’s Spider-Man films and treads a fine line between offering gore and language light “family friendly” superhero quipping – although the 15 certificate probably means it stuck with its gory origins rather than compromise too much. We go through the usual origin story stuff, with some zingy one-liners and zippy camera moves increasingly being slotted into action towards the end but Venom does this in a fairly dated (pre Marvel Cinematic Universe) way. Before the Marvel films conquered all, there was a nascent genre of more serious, comic book films with additional violence and cgi – such as Blade (1997) and it’s to these films that we should look for inspiration. 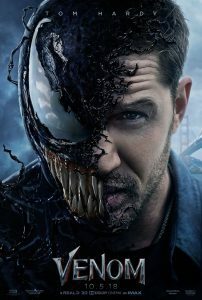 Tom Hardy, who played Bane in The Dark Knight Rises (2012), throws himself into the role playing both a grubby tabloid journalist – Eddie Brock – and an increasingly anarchic alter-ego as Venom too. It does feel like there’s something missing from the middle of the film in terms of character development mixed with some glaring plot holes, though, as Venom lurches from a stumbling introduction almost directly into the third act via a series of action packed – if slightly hackneyed – chases. It’s such a pity that everyone else, including Michelle Williams as Brock’s ex-girlfriend, Jenny Slate as a scientist with a conscience, and Riz Ahmed as the all-too-obvious bad guy, are little more than paper thin plot cyphers although there are some good ideas in this film amongst the carnage (wink, wink). As usual, stick around the credits. There’s a really good teaser for a sequel in the mid credits, and if you can stay till the very end after the inevitable CGI-fest there’s a lengthy extended trail for a forthcoming animated Spider-Man movie – so he does get into the film in a way. In the end, it would be a massive risk to introduce Venom into the full-time Marvel Cinematic Universe but I think there will be an audience for this and the almost inevitable sequel. Summary: VENOM is a US sci-fi action fantasy in which alien organisms are brought back to Earth. This entry was posted in Shooting The Breeze and tagged film review, Tom Hardy, Venom. Bookmark the permalink.